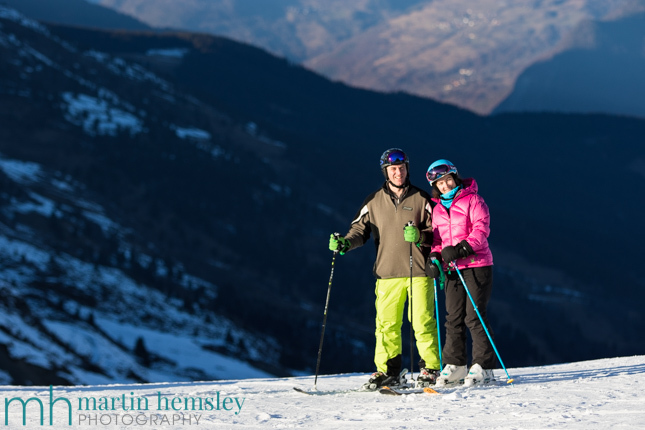 Hello everybody, it's Martin your favourite Ski Instructor again, direct from Méribel. So all of a sudden we have celebrated another festive period and are now at the start of a new month. The New Year often encourages people to both review the past, and to look forward to the future. So this is what I thought I'd do with this next blog post. Let's review the winter snow conditions so far shall we? As reported a few weeks ago (click here for the link), we had a fantastic early dump in November that went on for a few days, followed by some very cold temperatures. This enabled plenty of artificial snow-making to take place, which is always a good thing. But then we had what appears to have been the mildest December on record. We had day after day of sunshine, with very few nights dropping below zero degrees centigrade, even up on the mountain. So how did this affect the skiing over the festive period? In a nutshell, far from brilliant, but not a disaster either. Before I go any further, I would like to say how impressed I have been with the 3 Valleys ski area authorities yet again. The whole world appeared to be against them in terms of Mother Nature: the snow didn't fall, and the temperatures were too mild to enable much artificial snow-making. However, they did a remarkable job with what they had, and gave us some manageable skiable terrain. So 'Bravo' to the authorities. One positive we had was the stunning sunshine. Whilst Britain was being pummelled by rainy storm after storm, we had an extraordinary month of sunshine. Quite often at this time of year it can be freezing cold, but not this winter so far. I skied with Gilly and John for several days; John just wore a jumper as his external layer, and Gilly didn't need her usual fifty-three layers of merino wool to keep her warm (as is normal). So all fun. But how about the snow? As the festive period got busier, the reduced numbers of pistes that were available became icy, very icy. This is where I'm now turning away from pretending to be a Méribel Snow Reporter, back to a Ski Instructor. For many years I've had the absolute pleasure of teaching Gilly and John. They are both very good skiers, in fact I would happily describe them as expert skiers. 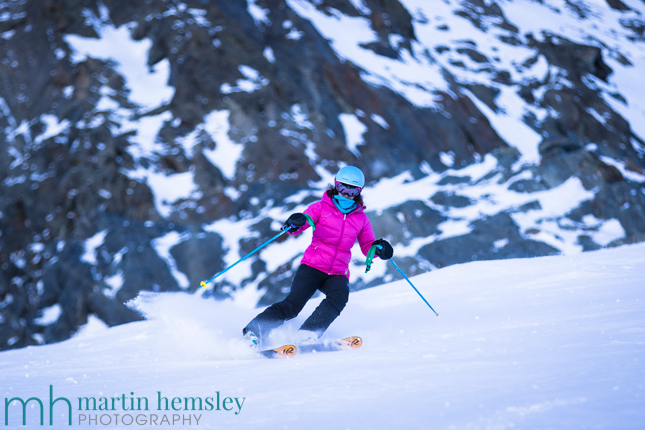 They can ski any colour piste, they ski bumps and off-piste, and in fact I have taken them down some pretty steep couloirs and other intimidating terrain. But their quest for further knowledge and fine tuning continues at an admirable pace. Just because we didn't have the usual massive ski area available with abundant fluffy snow, we weren't going to cry into our tartiflettes and cafe gourmands. Like any challenging situation, we looked to see what we could create. It soon became apparent that skiing on ice was going to have the biggest affect on our skiing performance. Skiing on ice really does 'seperate the wheat from the chaff' so to speak. It's possible to have a long discussion on how best to ski on ice, but I'll do my best to summarise as much as possible. In the past I've spoken about four 'Performance Threads' that can have an overall affect on a skier's performance: Physical, Tactical, Technical and Psychological. That reminds me, perhaps I'll write about these in more detail later this winter. Back to the now, and let's quickly go through these with Gilly, John and the ice. Physical - Gilly and John are both physically fit, healthy and not carrying any injuries. So all good there. Tactical - We spoke about how to tactically deal with the ice; ie stay balanced and aim for the fluffy snow, usually found in small piles at the side of the piste. So all good there as well. Technical - Balance first. We discussed that we had to be accurate with our fore and aft, lateral and rotational body management. Steering second. We examined how patient steering (or turning of the skis) was more beneficial than rushing a turn. So all good there again. Psychological- We learnt to embrace the ice, and not fear it. Being able to recognise the fact that if you heard the ice meant the skis' metal edges were scrapping away doing their thing. Time to relax in fact. All good yet again !?! There is a lot to take on board in this summarised short paragraph, but obviously on the mountain we practised the above over time even when we had half decent snow to ski on. All of the above are very very basic things to perfect, but especially crucial in such times as these. We also used a camcorder to study each others performance. If used correctly, it can be an extremely useful tool. We went through the four 'Performance Threads' when reveiwing footage, which helped our knowledge and understanding further. 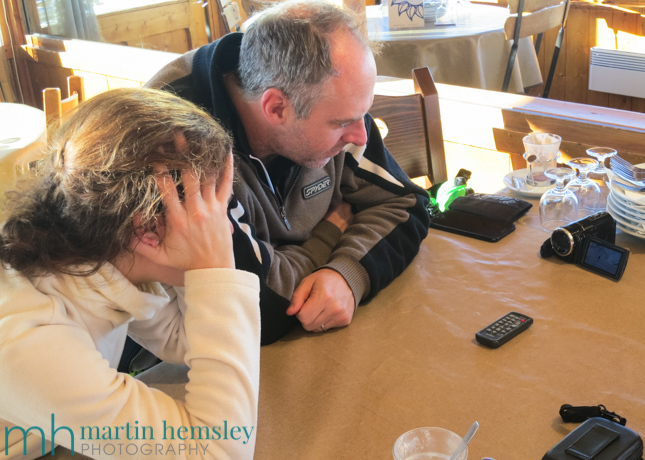 Speaking about reviewing the footage, we found what worked best for us was to go through this process up on the mountain whilst having a hot chocolate. Quality of life and all that. 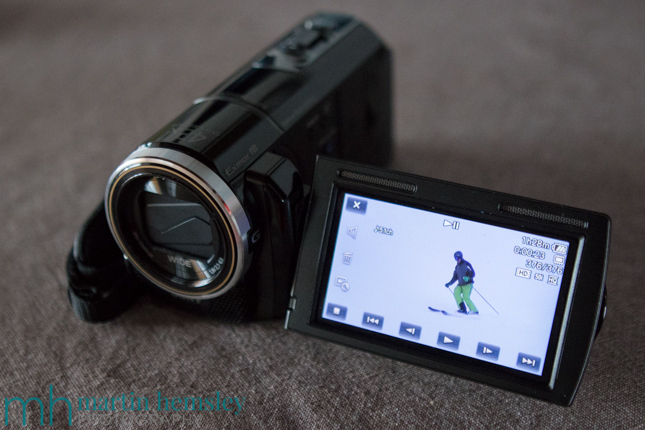 Joking apart, looking at yourself on video on the mountain means that it is fresh on your mind as soon as you get out skiing again. Psychology played a major part in everyone's performance. 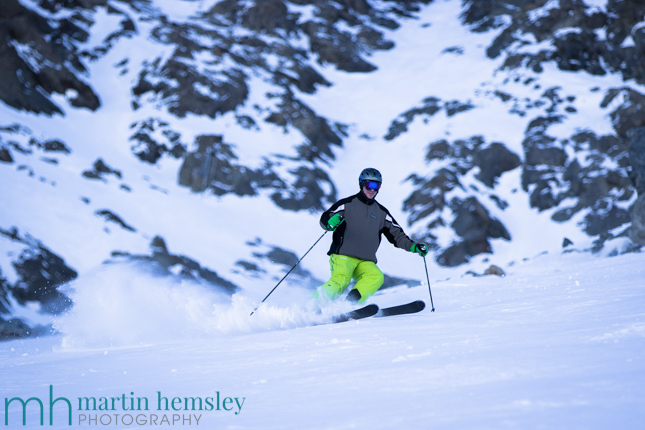 There were times when skiing on quiet pistes that weren't too steep felt fantastic. And yet other times on similar gradients, where the snow conditions weren't as complimentary, we really had to focus to achieve success. 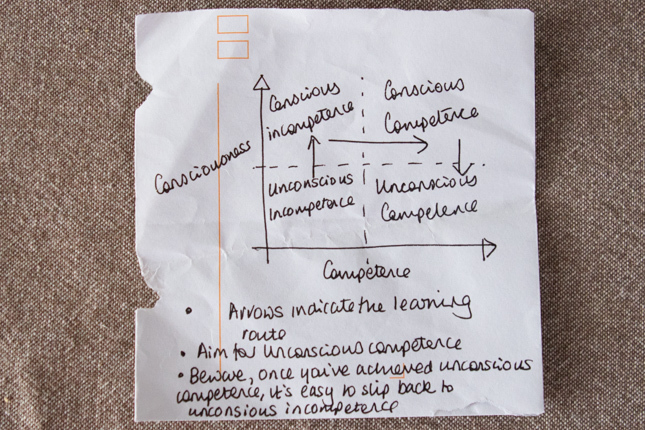 This in itself set off a discussion that Gilly and John were very famliar with, resulting in summarizing the 'conscious competence learning model'. This matrix is used by them and their colleagues in a completely different environment at work back in London. It was fascinating to see how this model can be used in all sorts of situations, including on the mountain whilst skiing. Ok, perhaps getting a little theoretical here, but if this is of interest to you then I suggest you search on the net for some inspiration. Right, enough of all of that, back to the skiing. 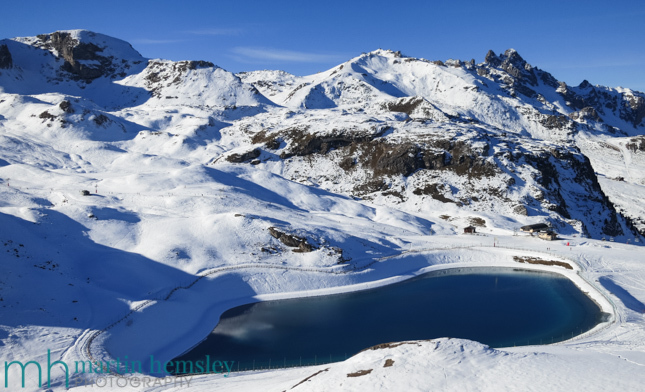 One advantage of spending many winters in Méribel is building a bank of information that can be called upon when required, one example being able to find good snow during snow-shy times. 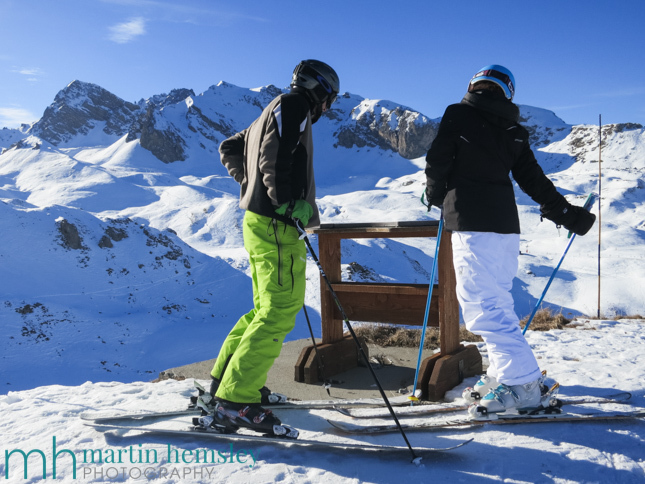 One of the many advantages of being in the 3 Valleys ski area is having easy access to Europe's highest ski resort, Val Thorens. There was a pitch that I wanted to take Gilly and John to, way above 3,000 metres, where the aspect faces direct north. This meant it was the best opportunity to find nice snow. The access to this pitch was at the top of a black piste via a rather feisty entrance. We weren't put off, slight fib actually because there was a little psychological thing going on to get through. The way we dealt with it? Diagonal side slipping on sheet ice. After that the snow was better just off to the side of the black. I took my mate Canon along to take some photos. Here is Gilly in action. Doesn't she look amazing? Can I just remind you, this was a very steep gradient (even though it doesn't look it), and Gilly is nicely balanced. This all helped her control line and speed down the mountain. Hang on, wasn't that what we were perfecting on the ice through most of the week? Here is John on the same pitch. He also looks fantastic, and I have to say I think this was the best that I've seen John ski over the last few winters. We were all buzzing after that, and headed down into Val Thorens in search of a plat du jour, and a cafe gourmand. 'Chapeau' Team. So, back to the original question at the start of this blog post - how did we all cope with the poor snow conditions recently? I think you would agree that some of us did rather well indeed. Having a focus can really help. Now to the really important news, it has snowed about 25 cms already this weekend, and we are due even more tonight, plus further weather fronts are on their way this week. There are all sorts of large depths being quoted. It is all speculation, but needless to say Lady Luck has woken up and decided to put smiles on our faces. The skiing this morning by the way was amazing. So all good again. If you enjoyed this blog post, you might like another I wrote earlier this winter, click here for the link. Feel free to share away on Facebook, Twitter, Google+ and LinkedIn by using the social media icons. Or leave a comment below. 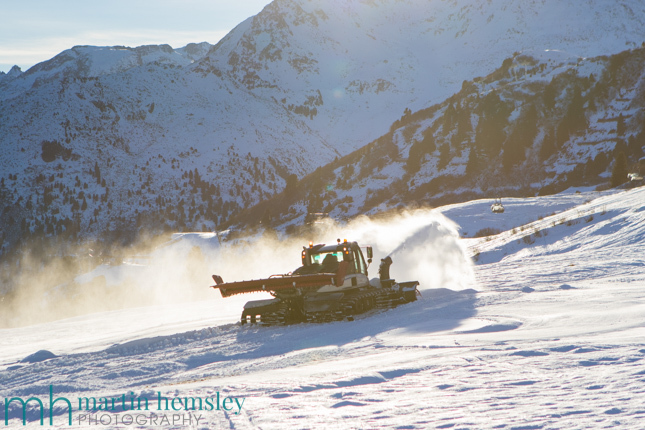 Happy New Year everyone, and stay tuned for further news on the fresh snow. Martin.